Maybe it was my body prepping for all of these workouts coming my way (first run today - 3 miles of success! ), or maybe I was in some serious need of protein, but over the last few months, I have found myself working eggs into more and more meals. Eggs have long been a stand-by of mine for a quickie lunch for work when the pantry is running low (today...) and of course we enjoy eggs for breakfast and brunch whenever possible. Eggs are such an awesome power food and oh so budget-friendly. I never tire of coming up with new combinations for them, either. Recent favorites of mine included omelets stuffed with shredded cheese, canned tomatoes and sauteed shallots, cheesy scrambled eggs a la Waffle House (the secret: two slices of low-fat Kraft Singles, ha!) and then of course, the Mexi-breakfast I shared here last week. Eggs for dinner happen less often in our house. But when they do, it's an awesome thing. When trying to maintain a healthy lifestyle, every once in a while, you have to splurge to keep your sanity. For us, pizza is that splurge. 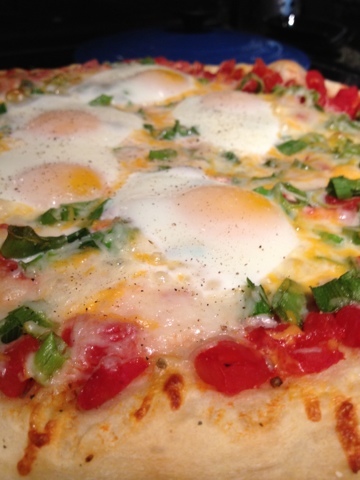 Making pizza at home, though, can help control the crazy calories, so we have been doing that more and more. We make pizza once every few weeks, and try a new combination every time. Pizza of the week last week? 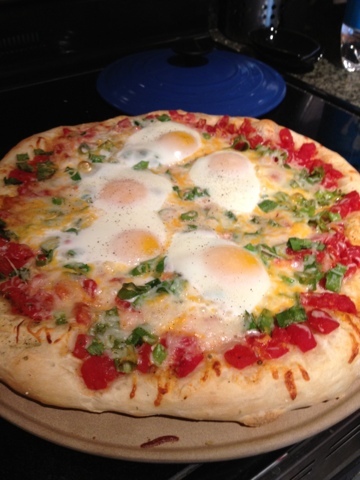 Pizza with eggs! 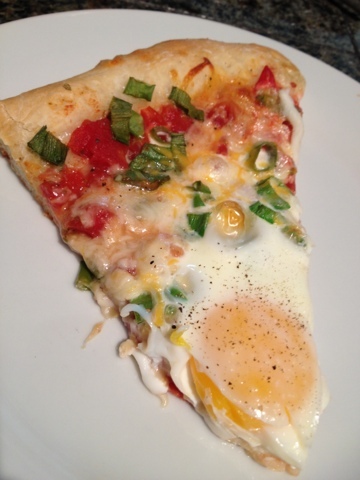 My favorite part about putting eggs on a pizza is when the yolk breaks as you take a bite. Just when you thought pizza couldn't get any more decadent, there it up and did! Here's how we made this gorgeous pie: We started with dough from Publix (tip: let it sit at room temperature for 15-20 minutes, and then sit again once you stretch it out to help it best keep it's shape once in the oven) and added canned tomatoes as a "sauce." Then we added an entire bunch of diced green onions, shredded Mexican cheese and a few of our favorite spices. 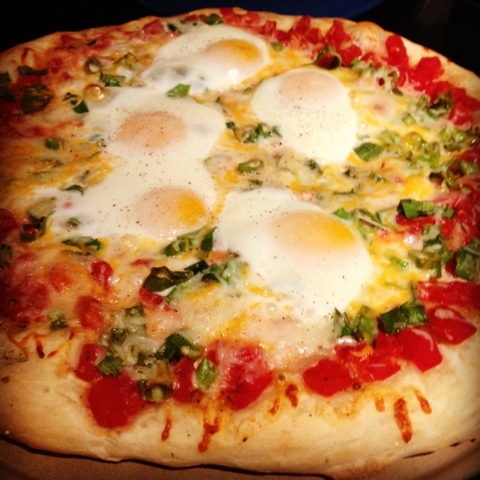 While that alone would have made for an awesome Mexi-style pizza, the eggs really bring it home. We cracked five right on top, taking care to keep them away from the edges so that the whites wouldn't inadvertently run over. A sprinkling of salt and pepper later, and the pie was ready to bake. Fifteen to twenty minutes later on top of a pre-heated pizza stone in a 450 degree oven, and the crust was browned and the eggs were set. This pizza really hit the spot for us that night, and I can't wait to make it again. If this particular combo doesn't do it for you, though, check out some of my other favorites on this post, or go rouge with a cauliflower crust with these tips.